Posted on 29, November 2017 by EuropaWire PR Editors | This entry was posted in Construction, Electronics & Machinery, Germany, Industrial and tagged certified industrial cables with CPR approval, fire-retardant cables, Leoni. Bookmark the permalink. Leoni’s fire-retardant cables significantly reduce ﬂame propagation and heat generation in buildings and simultaneously minimise the probability of caustic gases and smoke escaping – these are now also available with CPR approval for industrial applications. Moreover at the SPS IPS DRIVES Leoni presents its wide-ranging portfolio of factory automation products. NUREMBERG, 29-Nov-2017 — /EuropaWire/ — Leoni, the leading European provider of cables and cable systems to the automotive sector and other industries, has developed fire-retardant cables that significantly reduce ﬂame propagation and heat generation in buildings and simultaneously minimise the probability of caustic gases and smoke escaping – these are now also available with CPR (Construction Products Regulation) approval for industrial applications. The cables have been tested according to the new European EN 50575 standard. From 28 to 30 November, the cables specialist will be presenting these solutions as well as its portfolio of factory automation products at the SPS IPC Drives trade fair. Since July 2017, power and control cables as well as communication cables comprising copper or fiber-optic technology, which are intended for permanent use in buildings, must be made in compliance with the European EN 50575 standard – compliant cables are given a CE mark in accordance with the EU 305/2011 Construction Products Regulation. 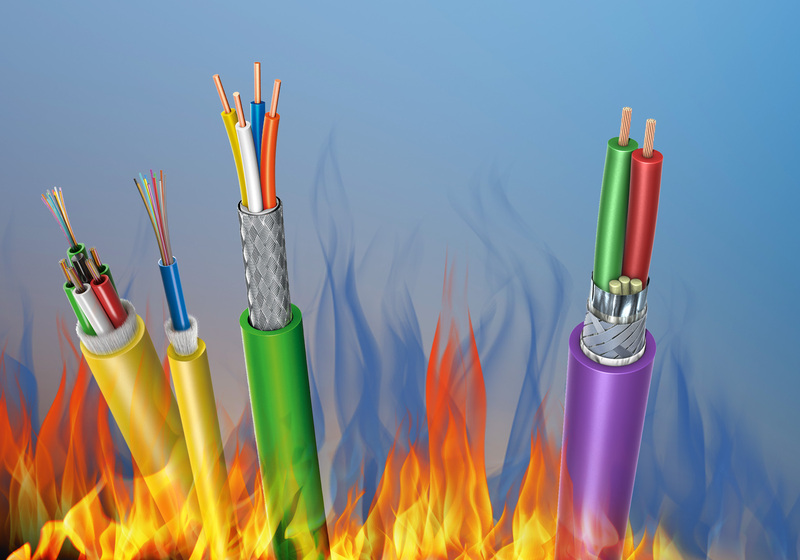 Leoni’s fire-retardant cables fulfil the regulation’s requirements and can reduce ﬂame propagation and heat generation, while simultaneously releasing less caustic gases and smoke. The specific aim with these cables is to prevent fires in buildings and to reduce the risks of any fire that does occur. These cables are available in seven classifications – Aca, B1ca, B2ca, Cca, Dca, Eca and Fca. Leoni now also provides certified industrial cables with CPR approval – such as a PROFIBUS cable and a PROFINET cable for automation engineering. These cables are designed for fixed internal wiring in industrial networks and guarantee first-rate transmission properties for use in such rough ambient conditions. Leoni also provides CPR-approved EIB (European Installation Bus) cables that are deployed in building automation; among other things to control blinds, to regulate heating and for alarm systems. All the aforementioned cables moreover have a halogen-free FRNC jacket, which inhibits fire and prevents smoke from developing; nor does it have any corrosive components. Leoni will furthermore showcase its Industry 4.0 solutions at this year’s SPS IPC Drives trade fair, such as its advintec 6D laser calibration system. It measures grippers, part location and devices in robot-supported applications in-line, i.e. directly in the production process, and thereby extends the range of options for machine perception. The advintec TCP system for calculating and calibrating robotic tools and equipment in up to 6 dimensions will also be on display at the fair: it measures the tool or the equipment electronically in up to six dimensions. The robot programme is automatically adjusted for the tolerance deviation and ensures that the tool always works at the correct position. Leoni’s exhibited product portfolio will also include cable solutions for the common bus systems used at all automation levels, motion control cables for drive technology, data cables with an oil and drilling fluid resistant jacket for the heavy demands in shipbuilding and the offshore sector as well as hybrid cables that combine even complex supply and control tasks, and at the same time go far beyond copper-based transmission. Visitors to the SPS IPC Drives fair will also be offered further information on the joint displays of AS International in Hall 3, Stand 510 and of the PROFIBUS user organisation in Hall 2, Stand 539.